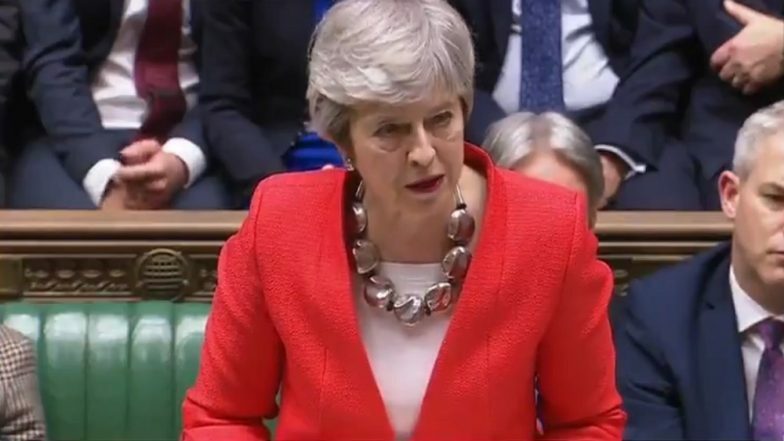 London, March 25: British Prime Minister Theresa May on Monday said there was "still not sufficient support" in parliament for her to bring her Brexit deal back to parliament for a third vote. "As things stand there is still not sufficient support in the House to bring back the deal for a third meaningful vote," May told parliament, voicing hope that this could change later in the week. "I continue to have discussions with colleagues from across the House to build support so we can bring the vote forward this week," she said. May said the government would provide time to allow MPs to debate and vote on Brexit alternatives to find a plan that could command a majority in parliament. UK Prime Minister Theresa May in Last-Minute Push to Win Brexit Support. But she warned it would be an "unwelcome precedent to set, which would overturn the balance of our democratic institutions. "I am sceptical about such a process of indicative votes," she added. "When we have tried this kind of thing in the past, it has produced contradictory outcomes or no outcomes at all."